There’s a whole host of development locally that will bring opportunities for local people; Under Construction is determined to support local jobs for local people. We’re very pleased to be supporting the new Mercure Hotel with finding its workforce and have recently been the location for interviews of job opportunities advertised in August. More opportunities will be available in the new year, please review our events page for more information. We’re really pleased to Welcome the Positive People project to Under Construction on Tuesdays. If you’re aged 18+ and not in work this project could help with new skills and one:one support back into the workforce; Inspiring you to build a brighter future. Everyone should have the chance to succeed in life, to develop skills and build a career. Positive People is a flexible community programme designed to help you overcome whatever challenges you face.Run by Pluss and our community partners we can help you manage the tough times, get qualified and find work. Our change coaches will work closely with you to help you identify your aspirations. Personal development – help build your confidence and health. Help with daily life – including advice on housing, money / debt, childcare, healthy eating, leisure, relationships, anger-management. Help to manage your health condition. Help to master digital technology –including computers, tablets, phones and software. Help to access training – anything from basic skills to vocational and professional. Job search – preparing CVs, applications and interview We will also help you approach employers. Access to computers, internet and printers. Digital Support – Switch On, Get On, Move On! 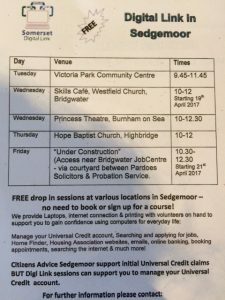 Free drop-in sessions to improve skills and get online! No matter what level you are our friendly volunteers will help. Come and see how being online could make a difference to all areas of your life: work, hobbies, daily tasks and so much more. So you can get online in a relaxed and secure environment Digital Link has set-up FREE web access sessions. The centres offer a safe, friendly environment to access the web for tasks such as Universal Job Match, learning new computer skills, finding training opportunities or job searching as well as registering for welfare Benefits or paying bills online. If you’re not sure where to start with a computer or just need to brush your IT skills, have no fear, our experienced and friendly volunteers will be on hand to help. As more and more services become ‘digital’, a basic knowledge of IT is really important. This is a great opportunity to learn new skills whilst knowing free support is on-hand to guide you. Equipment is provided all you need to bring is yourself. Tuesday’s 9.45am – 11.45am @ Victoria Park Community Centre, Victoria Road, Bridgwater. Wednesday’s 10 – 12.30pm @ The Princess Theatre, Burnham-On-Sea. Thursday’s 10-12pm @ Hope Baptist Church, Highbridge. Friday’s 10.30am – 12.30pm @ Under Construction, West Quay Close, Bridgwater.